Become a Resident - Free Spirit & Mind! The Enchanted Forest Community is tucked away in the Homesteads, one of the oldest districts in Phoenix. When driving or walking down the street you wouldn’t even know you are in the desert because of all the green, you will even notice a subtle difference in smell & temperature. Built in 1936 the Hearth or main house still has most of the original designs, windows, cabinets, sinks and plumbing! 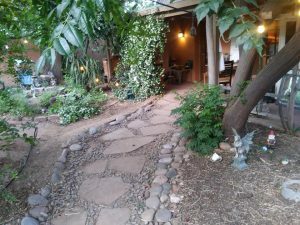 The property is a 1/3 acre irrigated lot filled with age old fruiting trees, walking gardens, terrascapes, 24′ geodesic dome and permaculture. We currently have 5 spaces for residents. And have been working on the hobbit hole earthship, which is in construction for another dwelling space. Target date for completion of this dwelling is January 2019.Along with our residents we have one beautiful cat & two dogs, which so happen to be snowbirds for the cooler months. CommUnity life at The Forest includes sharing the Hearth as a communal space featuring shared food space, dining area, a tea & coffee station, library, store, music zone, kids space, creation station (art & sewing zone), bathroom, outdoor kitchenette, coats closet and more in the works for our overall vision. However, each resident has their own space to get away, relax and unwind in a private space of their own. The residents enjoy CommUnity meals, work & garden parties, maintaining the land, creating new visions, exchange of ideas, laughing & regular heart space with one another on a regular basis. Residents also have the privilege to stay and visit our sister communities Wind Spirit between Globe & Winkleman and TerraSante near Tuscon. Both Communities are about 2 hours away and a wonderful place to escape, create, share common visions & play with the members & residents at each location.